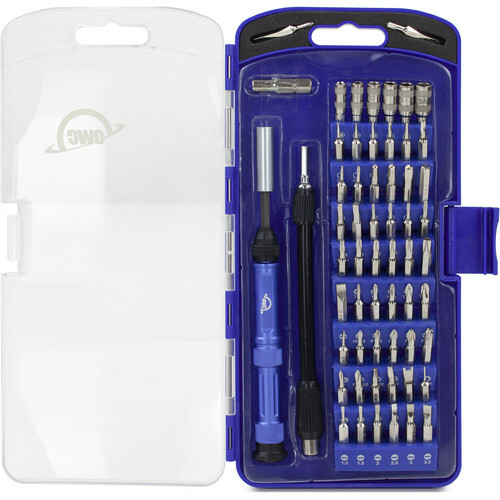 Service and repair computers, printers, and other small appliances with the 72-Piece Advanced Toolkit from OWC. This kit features a 58-piece screwdriver set that includes bits for pentalobe and Torx security screws, ideal for servicing Apple products. Also included is a six-piece bit driver set, plastic and metal spudgers, and a flexible shaft extension for hard-to-reach screws. ESD-safe tweezers and an anti-static wrist strap can help prevent damage to your electronics from static electricity. You can tote the tools in the included carrying case. The set includes 58 interchangeable bits, a utility knife, an anti-static wrist strap, anti-static tweezers, a SIM card ejector pin, an LCD suction cup, a triangle plectrum, plastic and metal spudgers, a stainless steel ruler, a cleaning brush, and a telescopic flexible shaft (adjustable to four different lengths and a variety of angles) that can help you access hard-to-reach screws. This toolkit features both standard pentalobe and pentalobe security bits that make it easier to work with Apple products that feature compatible screws. The included nut drivers come in 2.5, 3, 3.5, 4, 4.5, and 5mm sizes.